Hey, looks good, looks fun. Rack is busted with Mayael. You can repeatedly use cards in your hand to set-up the top of your library so when you look at the top five with Mayael you'll always have a creature to cheat into play. Sneak is excellent as an alternative way to cheat big creatures onto the battlefield while giving them haste. The Eldrazi: Kozilek and Ulamog are among the biggest and best creatures to cheat into play. Annihilator is busted with haste and when these Eldrazi/Blightsteel are sac EOT they go back into your library. Competitive Commander manabases use Fetch lands. They're especially good with three, four and five color decks because they give you so many choices of lands since they can tutor for dual lands. ETB tapped lands are not what you want to play when being competitive. You want all your lands to ETB untapped so you can use the mana they provide the turn you play them otherwise you'll get too far behind, not able to cast spells. Consider these lands for a more competitive manabase: Fetch lands, Shock lands (already have them), Battle lands (already have them), Battlebond lands, Filter lands, Check lands, Rainbow lands? Lets have a look at some possible additions: Savage Ventmaw would be good as you can haste it then get 3 and 3 the same turn, allowing you to cast more. Malignus is a must, he can kill a person in a single swing in your deck, especially with Rogue's Passage (which should also be an addition. Hydra Omnivore For those bigger games, and his a big boy. 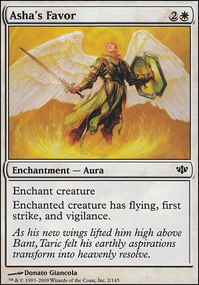 Etali, Primal Storm For those same cast turn swings that should get you some nice stuff. 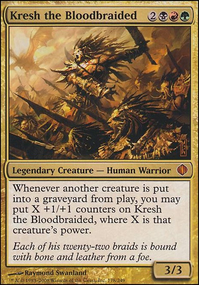 Ruric Thar, the Unbowed would be amazing, more so if you're looking at going creature focused. Hellkite Tyrant for steeling all the artifacts and a long drawn wincon (Vs artifact decks). Mina and Denn, Wildborn should replace on of your elves. Blightsteel Colossus is also a big wincon for you. That's it for creatures for now. Chaos Warp its an important card in red, its removal of used for keeping your own things safe. This is a fantastic instant for you. Blasphemous Act is an amazing removal card you should add. Defense of the Heart is amazing at getting creatures for you. Lurking Predators can cheat some brilliant things in, Greater Good gives you some amazing card draw as does Sylvan Library . 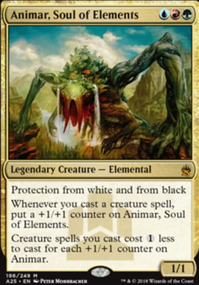 Now lets look at some mana ramp: Cultivate Rampant Growth Farseek Skyshroud Claim and Ranger's Path These should sort out any mana you need to find. 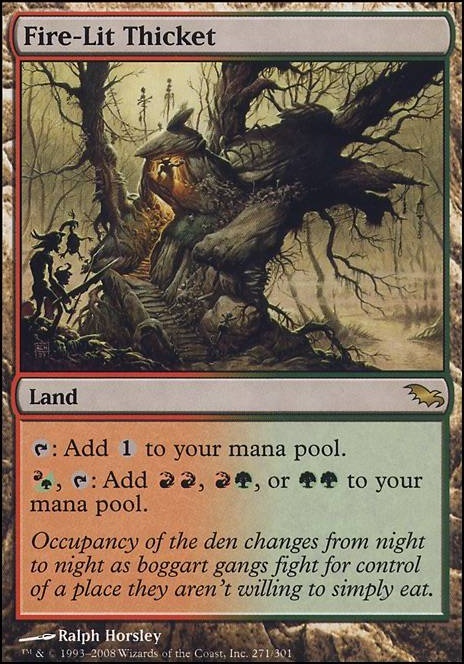 Land wise: Rootbound Crag Cinder Glade Spire Garden Temple of Abandon Stomping Ground Game Trail Kazandu Refuge and Fire-Lit Thicket sort out your duel mana. Skarrg, the Rage Pits Kessig Wolf Run Rogue's Passage Reliquary Tower Yavimaya Hollow Ghost Quarter and Maze of Ith are brilliant for being utility. Spinerock Knoll and Mosswort Bridge are amazing single colour for extra things. And Nykthos, Shrine to Nyx is highly recommended. Domri Rade and Garruk, Caller of Beasts are amazing plainswalkers for you. I think you may want to be a bit more careful with the phrase "price is no issue." It's one thing to say you're willing to spend a couple hundred bucks to pack in some real firepower, but if you tell folks there's no ceiling on this Wonkavtor I can (and will!) go ahead and suggest a $1000 in mana base upgrades. 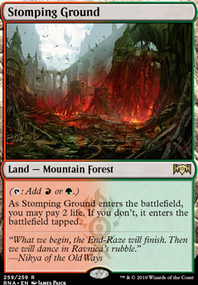 You can save a good deal of money and cut all the / lands without hurting yourself much since the deck is mostly , and ramp lets you fix. Though they're still strictly better than just a straight Swamp or Mountain. That said, even at 50% green spells that's not enough reason to be running Emerald Medallion over basically any rock. Alright, that about covers it for the mana base. I've run out of suggestion boxes so I'll break this into two posts. Okay, like the deck, but it's best plays are fast, Noble Hierarch is an Elvish Mystic that can pump in this deck, and this deck really needs the turn one Birds of Paradise, it allows red, and though you run the Fire-Lit Thickets, it doesn't play out well too often with the Noble Hierarch unless you get Groundbreaker. Sideboard confuses me with this one a bit, would love an explanation for Back to Nature over another Destructive Revelry. Ima go build up a faster version of this deck, possibly running a naya burn style deck with Boros Charm, but instead of a normal burn deck, what I love about this, is it shows how to build a more midrangy burn deck, with larger, more impactful damage. The rest is to upgrade land section. Shocklands is a must. You dont want most of your land ETB tapped all the time, it will leave you far behind than your opponents. Dual lands from BFZ is fine but inconsistant, your basic lands is quite low. And why dont you bring Farseek, Skyshroud Claim, Tempt with Discovery or Krosan Verge(the worst) maybe ? it will help you search and fix color by finding your duallands. Temple of the False God Ancient Tomb for boosting mana. i have changed up the deck to make it less expensive by taking out one of the lands which ran at 32 dollars each, because it really didn't give us a big advantage with our mana. Just so you guys know. The land was Fire-Lit Thicket. It would not change to a non-foil version of the card, that is why it was running at $32.